Manfred has some changes in mind especially for the NL; What do you think? Pick up to three of these proposed changes you like. The commissioner of baseball works for the thirty owners of the Major Leagues. Pressure is on him to improve the game. Rob Manfred was named commissioner in 2015, and he has only witnessed the popularity of baseball decline with the youth. 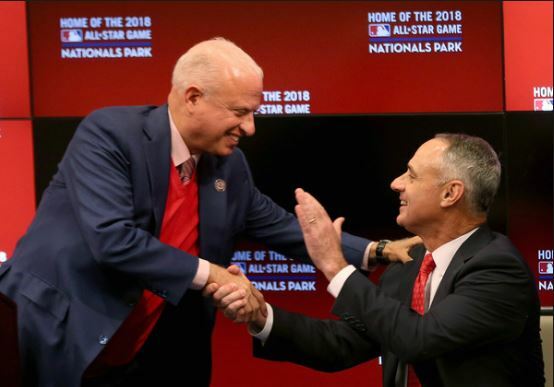 Manfred wants to make changes to the game, and one of the changes is eliminating the pitchers batting in the National League while adopting the designated hitter rule. Time to have some fun with a couple of polls along the lines of Change is Good vs. Get Off My Field. Conversations between MLB and the Players Association appear to be getting serious about about implementing some rule changes. Some perhaps for the 2019 season. Assuming you had a say in which rule changes you would implement, what are your top 3 independent of whether they happen this year, next year, or any year thereafter. Since the likelihood that none of these ever happen is about as likely as Bryce signing with the Marlins for the major league minimum, the poll does not offer a None of the Above choice. Please vote using the poll at right. One of the rule changes would bring the DH to the National League. Does the likelihood of that becoming a reality change your opinion on the Nationals re-signing Bryce Harper. In addition to the Yes vs. No answer, we’ve added a third choice – that you would like the Nationals to re-sign him regardless. Again, vote in the poll at right. And check out our TalkNats post from November, 2015 which included a poll on the DH: Time for MLB to get rid of the DH. That poll is closed – but the sentiment back then was no to the DH.